A hot shower is one of life’s simple pleasures and one that most of us count on without giving it any thought. So when that shower turns unpleasant due to low water pressure or no hot water we want a simple fix. The problem is quite possibly a leaky water heater. Troubleshooting the exact cause starts with understanding the various causes of water heater leaks, and the first step is examining the tank to find the source. One common cause — and the easiest to fix — is a loose drain valve. A drain valve can loosen over time and create a slow leak. Simply tighten it with a wrench just until it is snug. Be careful not to over tighten it and don’t force it. Pressure can build up in the tank. This forces water to leak out of the tank in order to relieve the pressure. This occurs most commonly when the water temperature is set too high. It can also happen if the pressure from the exterior water supply is too great, or if the temperature pressure relief valve is defective. Water heaters typically last 8-10 years. As they near the end of their lifespan, corrosion becomes more evident and can result in a leak. If this the case, call your HVAC technician immediately to address the problem. Waiting too long puts you at risk for flooding and the damage and headaches that come with it. 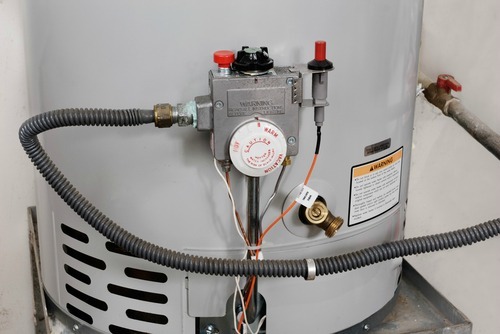 Condensation can occur on the outside of the water heater when cold water enters the tank and the outside air is hot. This can sometimes be mistaken for a leak, but it is normal and common. Simply wipe down the water heater. Water heaters are often made of steel, which is mostly iron. An anode rod inside prevents the iron from rusting, but over time, the rod can wear out and fail. If that happens, the rust will eventually create a leak. Prior to that, however, you may notice your hot tap water develop a rusty brown color. Call your technician right away to replace the anode tube and prevent further damage. Over time, the minerals that exist naturally in hard water can settle in the bottom of the water tank and create a layer thick enough to block access to the burner that heats the water. As a result, the burner runs longer to heat the water and the excess wear and tear leads to deterioration. This can cause a leak or, worst case, cause the water tank to burst. Prevent sediment build-up by flushing the tank once a year. Rheem Pro Partner serves Colorado and Wyoming. Contact us today for all your heating and cooling needs.